A. Glaser and R.J. Goldston of Princeton University have conducted research into the risks of nuclear materials associated with proposed fusion power plants being used in the productions of nuclear weapons . Clandestine production of weapon-usable material in an undeclared facility. Covert production of such material in a declared facility. Use of a declared facility in a breakout scenario, in which a state begins production of fissile material without concealing the effort. In the reserach the authors made a quantitative assessment of the risk of nuclear proliferation, that is using the materials produced in fusion plants for weapons. They show that it is not feasible to build a small-scale nuclear fusion system capable of producing weapons within a couple of years, in a clandestine manner. In essence such a plant could not remain invisible due to the power consumption and dissipation. Such a plant should be quite easy to spot. This is very different to nuclear fission plants, which can be much smaller in size and use far less power. Such fission plants’ power consumption is similar to lots of industrial processes and so a clandestine fission production of weapons could be hidden in an industrial setting. The second scenario is more plausible, but it would be very easy for inspectors to identify materials being used for weapon production in any declared open fusion plant. Again, this is not quite so easy in fission plants. The last scenario proposed is breakout; weapon-usable material is produced very quickly and without concealment. The hope being the producers can get a weapon ready before anyone can stop them. The minimum period to produce any weapon-usable material in a fusion power plant would be one to two months, as estimated by the authors. It is also easier and safer to stop a fusion plant than a fission plant once in operation. There are lots of other supporting infrastructure needed in fusion like the power input and cooling towers. All these could be interrupted with no risk of nuclear contamination. In all, fusion power stations would be safer and have less risk for nuclear proliferation than existing fission technologies. A. Glaser and R.J. Goldston, Proliferation risks of magnetic fusion energy: clandestine production, covert production and breakout, Nucl. Fusion 52 04, 2012. Dr Nick Cross, University of Edinburgh. Astronomers have created an interactive mosaic of our Milky Way galaxy that shows something like a billion stars. The project, which has been running for 10 years, combines data from the UKIDSS/GPS sky survey acquired by the UK Infrared Telescope in Hawaii with the VVV survey data acquired by the Vista telescope in Chile. Astronomers at Edinburgh and Cambridge processed and compiled all the data used in the mosaic and have made it available to everyone around the world for study. George Osborne in his Budget speech has pledged £100 million in an investment in major new research facilities in UK universities. This cash is will be very much welcomed. For Britain to be Europe’s centre for technological innovation, science-based businesses must be at the heart of the UK’s economic recovery. Details are patchy at the moment, but the money is intended to help attract private investors. This will be great for more applied reserach, for example joint university and industry research facilities. Whatever the details, this good news and hopefully will go towards offsetting the recent cuts. This is science driven by adventure to the limits of the human experience. On the 15th March 2012 Baumgartner leapt from a balloon capsule 71,500ft (22km) above New Mexico. He landing safely about eight minutes later. That skydive was used to test all the equipment before the dive from 120,000ft, hopefully later this year. I for one wish Felix Baumgartner and the rest of the Red Bull Stratos team good luck. The current record holder for the highest skydive is US Air Force Colonel Joe Kittinger way back in 1960. His jump was 102,800ft. Baumgartner’s jump is only beaten by two other men; Joe Kittinger and the Russian Eugene Andreev. The speed of neutrinos has been measured to be consistent with neutrinos travelling at the speed of light by the ICARUS detector at the CNGS beam. This is in stark contrast to the results of OPERA . The expected time of flight difference between the speed of light from CERN to ICARUS and the actual position of the vertex of the LAr-TPC events has been neatly analysed. The result is compatible with the simultaneous arrival of all the 7 events with the speed of light and not compatible with respect to the result reported by OPERA . T. Adam et al. [OPERA Collaboration], arXiv:1109.4897. Teachers should allow pupils to learn maths by using it rather than focusing on abstract concepts, says an expert. 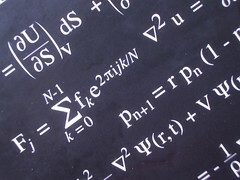 Mathematics has a reputation of being very hard to learn. It is true that mathematics is a difficult subject that is multilayered and involves abstract thinking. This is compounded by the way in which mathematics in the UK is taught. Quite often it is difficult to see how mathematics is relevant to the everyday world. For those of us that know, we see mathematics all around us. Professor Dave Pratt of the Institute of Education argues that teaching methods should help the students engauge with mathematics and see how it is used. Mathematics is not just pure abstract thinking, but is a powerful tool to be employed in many contexts and this should come across in the teaching of the subject. My paper “Odd Jacobi manifolds: general theory and applications to generalised Lie algebroids” has been accepted for publication in Extracta Mathematicae. In this paper we define a Grassmann odd analogue of Jacobi structure on a supermanifold. The basic properties are explored. The construction of odd Jacobi manifolds is then used to reexamine the notion of a Jacobi algebroid. It is shown that Jacobi algebroids can be understood in terms of a kind of curved Q-manifold, which we will refer to as a quasi Q-manifold. I will post more details in due course. Royal Fort House, University of Bristol. Picture courtesy of the YRM 2012 committee. The Young Researchers in Mathematics Conference is an annual event that aims to involve post-graduate and post-doctoral students at every level. It is a chance to meet and discuss research and ideas with other students from across the country. As I said in an early post here, I will be attending the YRM 2012 conference and giving a talk. My talk will be about Higher Contact Structures and Supersymmetry. See an earlier post about such structures here. The preprint that this talk will be based on can be found here. I will place a link to the slides in due course. Which reminds me, I better get on with writting them! Professor Stephen Hawking has filmed a cameo for US sitcom The Big Bang Theory, due to be aired next month. Who will win this clash of the physics titans? Sheldon Cooper, B.S., M.S., M.A., Ph.D., Sc.D. Stephen Hawking, CH, CBE, FRS, FRSA. A £50m package to attract ‘star scientists’ to Wales has been unveiled. This is great news. Welsh universities could do with this boost given the recent troubles in science funding and the anxiety over the student fees. Our universities have the opportunity here to work with the best research groups across the world and strive for excellence.